Last September I blogged about Jonah's first day of preschool and entitled it Seasons Change. Well, two days after saying goodbye to the dogs, Jonah had his last day of preschool (at least for now). Considering my emotional state about the dogs and the knowledge that we were going to be moving in a couple of weeks, I was more nostalgic and sad about this day than Jonah. With our new home being significantly further away, I knew he would not be coming back to that preschool and I was somewhat saddened that he would not be able to continue developing his friendships nor I the relationships that I had begun through the school and my MOPs group, both of which used the same facility. Jonah was pretty clueless and seemingly tired of getting up and out in the mornings three days a week as well (Kudos to you moms who work outside the home and have to do that 5 days a week!). I have been finding that Jonah is not really a morning person. (I wonder where he gets that from? Well, I'm congenial enough in the mornings, but I like it quiet and subdued until I've had a couple of cups of coffee and checked email. Jonah similarly likes his apple juice and a couple of cartoons before being shoved out the door in the morning.) So on this last day of school, Elisabeth and I popped in early to hang out with the class and get some pictures to document this milestone. 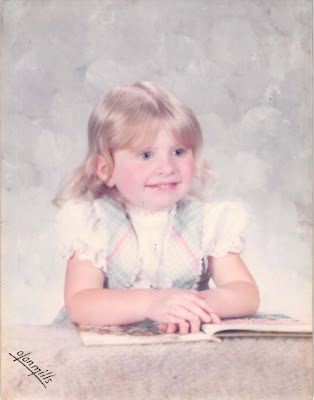 Elisabeth enjoyed sitting and eating pizza with the big kids and later going out on the playground with them. After a year or so of consideration, we finally decided it was best for us and our Italian Greyhounds to turn them over to a rescue. The details of why, I really don't want to get into here. (Although, for me, motherhood certainly played a role.) It was a hard decision to come to and probably the hardest thing we have ever done. We found a really great rescue in our area that was able to take them, Triangle Italian Greyhound Rescue. 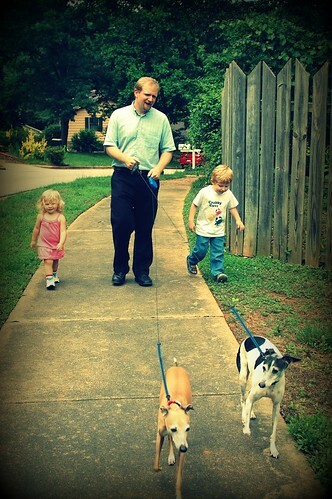 So on Wednesday, May 26th, after 10 years with Toby and nearly 9 with Leto we took them on a walk around our neighborhood and then drove them to the rescue. It was a sorrowful, emotional day. This was the first and biggest change in our season of transition and it's impact is still being felt. We still miss them a month out, and I have moments where I still feel pangs of sorrow and guilt. This will somewhat be relieved once they are placed in new homes. Anyway, if you happened upon this post and think you may be the new parents for Toby and/or Leto, you can contact the rescue and review their adoption process here. If it works out, by all means leave me a comment. We would love to stay in touch with their new "people," but that will be totally up to the new owners to decide. We've had a lot going on the last few weeks, thus the limited blog activity. Lot's to blog about just no time to do it. Within a three week period we said good-bye to our dogs, Jonah had his last day of preschool, we had a yard sale, and we moved across town (well technically a different town, but still a local move). After a month of nonstop activity, we are now feeling a bit more settled and enjoying our new home. So I will soon get back to it. It is a great outlet for me and I've missed it. So stay tuned...... Lots of updates on the way. Well, my last post elicited many comments that suggested Elisabeth looks like her grammie. When she and I are out and about people will always say she looks like me, until they see Jonah then they say he definitely looks like me. So, just for fun, I thought I would post these comparisons. Here is Elisabeth at 22 months and me at 19 months (I always looked mature for my age), and Jonah at 21 months. 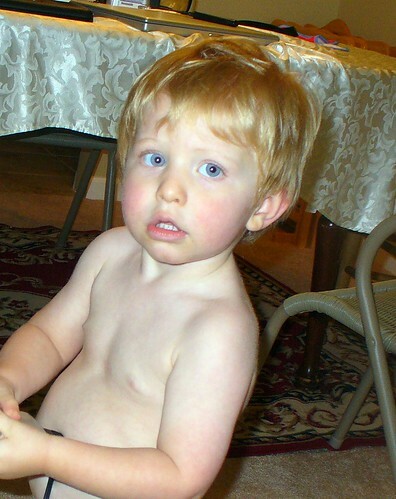 It was hard to find a comparison picture for Jonah - he was usually a blur or looking away from the camera at that stage - not quite the camera hog that he is now. Enjoy! The little girl in the first picture is the grandmother in the second. 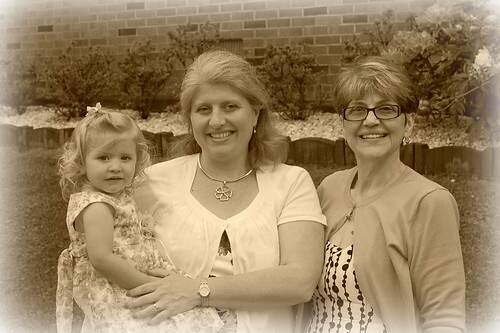 Five generations are represented in these pictures. 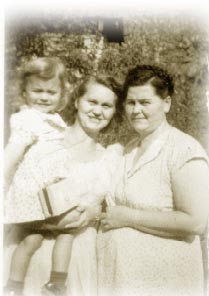 (left) My mom, my grandmother, my great grandmother. (below) Elisabeth, me, my mom. 0406101441a, originally uploaded by planetdavis23. My hubby just downloaded some pictures that I have texted him over the last months. This was a photo from a stop at Target a while ago. Elisabeth indicated that she wanted help trying on the hat. 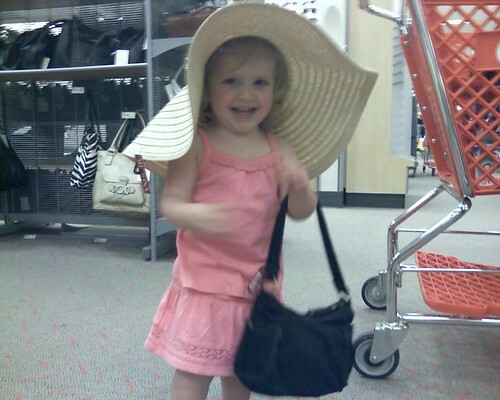 Once on, she promptly picked out a a purse to go with it. Girls are so fun!